5793 labyrinths found. Showing 4621-4640. Sorted by country, state, city, then zip/postal code. Outdoor labyrinth in garden setting open to public at all times. This labyrinth installation is phase 1 of the implementation of a larger public park master plan. This is located between Ruch, which is 6 miles away, and Applegate, which is 1 mile away. It is open by appointment. We are a care farm and domestic animal sanctuary located on the Applegate River in Southern Oregon. Tours by appointment only, please call and make arrangements. Currently tours on Wednesday and Friday. Call to make appointment. Located in Eastern Oregon, in the John Day Valley at 767 E. Main St. (also known as Hwy 26) on the east side of town. Please call in advance to bring groups to walk the labyrinth. Canyon Mountain Center, Meditation & Well-Being, is owned by Jim & Sandy Bay. St. Paul a la Chartres design. The paths are lined with brick with sand on the walking surface. 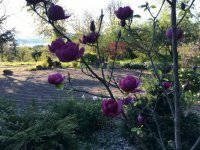 Located on 30 acre healing/retreat center grounds 18 miles south of Klamath falls off Hwy 97. Beautiful sweeping high desert views next to Bald Eagle Sancutary. Check web site for details. Usually open - closes for private events. Please call Robert or Sharon to check for availability. May be closed for private event. Snow can cover the labyrinth in the winter making use difficult to impossible. Looks like an empty lot, but look closer. Open to the public 24/7, this privately owned labyrinth of octagonal shape, is formed from earth/grass with brick outline and a nice round bench under a tree in the middle. Built in cooperation with landowner Lisa Hill and The local Episcopal Church with all volunteer labor and dontated brick. Privately owned but public access granted at any time without permission. Owner of property is Lisa Hill. Available for workshops, in-services and special events subject to owner's discretion or with owner facilitating. Directly to the West (behind) the North Kenny's IGA mall. The Congregational Church United Church of Christ in Lincoln City, Oregon, is delighted to participate in TLS first worldwide labyrinth day on Saturday, May 2. Our 30 foot Chartres labyrinth will be open for the public to walk from 12 noon to 3 p.m. The Labyrinth is at the Parkview Center. For directions go to www.mac-coop.org and the follow the link to Related Ministries. The labyrinth is on church property at the side of town. It is not in the church building. 123 11'° Lat. ; 45 12' ° Long. An original design. Made of river stones laid out on the back lawn. 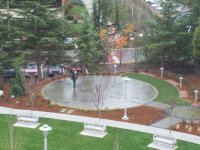 Located on the north side of the Tower at Rogue Valley Medical Center on Siskiyou Blvd. 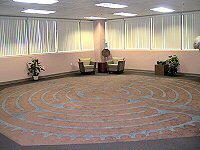 We also have a 25 foot "Petite Chartres" canvas labyrinth, available for rent to appropriate groups. 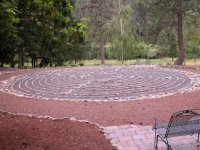 Labyrinth retreats and workshops available both on and off-site. Open Monday - Friday, 9:00am - 5:00pm for individual walks. TeBri's Lavender Labyrinth is created from 680 Buena Vista lavender plants. In TeBri's labyrinth, two or more enter each half of the labyrinth simultaneously, each walking half of the labyrinth and meeting at the 14 foot gazebo in the center, then exiting together through the unified path. Adjacent to the Lavender Labyrinth, lies a 7 circuit, 35 foot turf and rock labyrinth. A small stone circle has also been added next to the labyrinths. Please see TeBri Turf Labyrinth listing for more information. Open First Saturdays May through November, Noon - 8pm. Memorial, Labor, and Thanksgiving Weekends. June 25 and 26 for Celebrate Lavender. Call for Appointments and Events. 6-circuit medieval style, only with two entrances walking simultaneously to the center, then exit together. Designed for ceremonial use, such as weddings. Turf and Rock Labyrinth beside the Ceremonial Lavender Labyrinth. Our Turf Labyrinth, with a red maple at its centre, sits adjacent to the ceremonial Lavender Labyrinth and is surrounded on three sides by Pinot Noir vineyard. Please see TeBri Lavender Labyrinth listing for more information. Turf Labyrinth is in the Chartres style with 7 circuits.